I've used the Enhanced Super GPS computer for 9 months and over 3,000 miles of road and trail riding. Pros Acquires satellite signal fast and holds it. Screen is easy to read and customize. Long battery life of 20 hours. Comes with out front mount. Syncs to Strava. Downloads rides from computer to phone via bluetooth, which also sends ride files to Lezyne Root and Strava once the process is finished. Picks up sensors easily. Cons Does not reliably display textcallemail notifications. Does not display starred Strava segments at all despite several email exchanges with Lezyne. Only does turn-by-turn directions unless you already mapped out a route in TCX format only. Lezyne Root website has possibly the worst mapping ever so you need to use RideWithGPS to get a TCX file and import it to Lezyne Root. 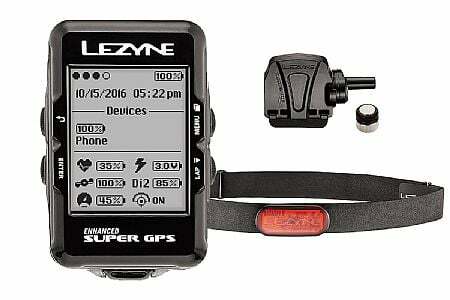 Cannot use Strava route builds because they do not contain turn-by-turn directions when uploaded to Lezyne Root. Lezyne out front mount is cheap plastic.